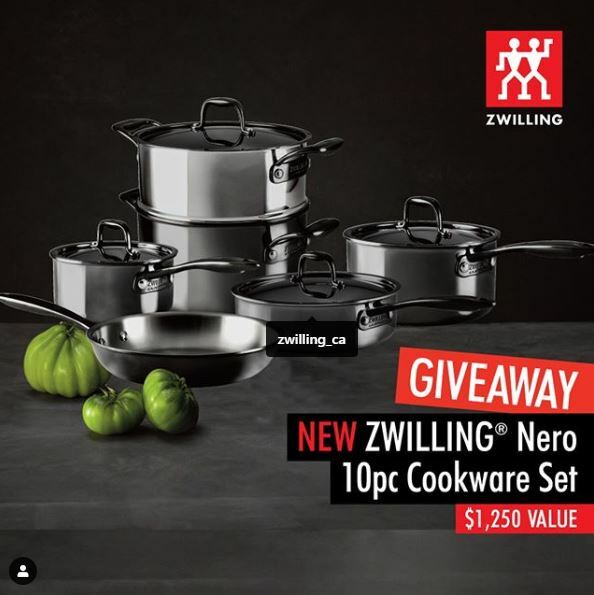 Enter the new Zwilling Canada Giveaway for your chance to Win the new Nero 10 Piece Cookware Set valued at over $1,000. This contest is open only to legal residents of Canada (excluding the province of Quebec) who are over the age of majority in their province or territory of residence. To enter you have to visit the official Zwilling Instagram page and follow it, then look for the post promoting this competition and use the comments section to tag at least a friend, tagging more friends will get you more opportunities to win. Contest ends on Tuesday, April 11, 2019 at 5:00 pm EST. Winner will be selected by random draw from all eligible entries. The winner will get a 10-pc Zwilling Nero cookware set valued at $1250. The Zwilling Canada Giveaway begins on April 8, 2019 and ends on April 11, 2019.